According to Adwords Policies, Google restricts the promotion of healthcare-related content such as prescription medication. This does not mean, however, that law firms cannot advertise to those who may have been injured by said prescription drugs. It is possible (and in compliance with AdWords Policies) to run informational ads involving pharmaceutical drugs – if you can figure out how. Assuming your ads are indeed not promoting pharmaceuticals, select the request a review box, and save your ad. Once your ads have been approved, it may appear that your campaigns are ready to rumble. Your keywords will likely show an Eligible status, as shown below. Your ads will show the following limited approval message – with the links taking you to Google’s Advertising Policies re: Healthcare and Medicines. Your ads relate to a restricted product or service. In order for your ads to start running, you’ll need to apply for specific approval. Where’d we get the list? Directly from the Support Specialists we’ve been in contact with. Both have claimed this information is not available in the AdWords Help documentation because “there are too many business types to list them all out.” Interpret that as you will (and if anyone has been able to find documentation on this, let us know!). Nonetheless, those appear to be the three things required. Once you’ve made sure your site is up to snuff, open up a chat with an AdWords Help specialist and ask for a Pharmaceutical Informational Certification for a law firm. They’ll verify your site meets the three qualifications above, and then, if all goes well, escalate your account to the policy team. Yes, you read that correctly. Your account goes from your AdWords Support Specialist, is escalated to the Policy team, returned back to your AdWords Support Specialist, escalated to the Ads Approval Team, and returned back to your AdWords Support Specialist. Once that dance is done, your AdWords Support Specialist will call you and let you know you’ve received your Pharmaceutical Informational Certification! In theory, all of this escalation and de-escalation will lead to the certification being applied to your domain within 24 hours of your initial inquiry. Pat yourself on the back, crack open a beer, and bemoan the $60+ CPC’s you’ll soon get to endure. 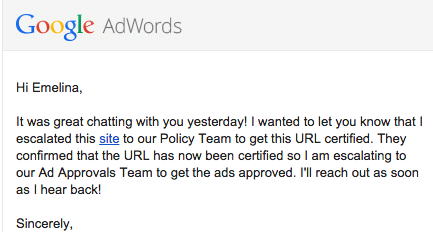 Step 3 (“Contact AdWords Support”) is especially good advice for anyone doing their own PPC. 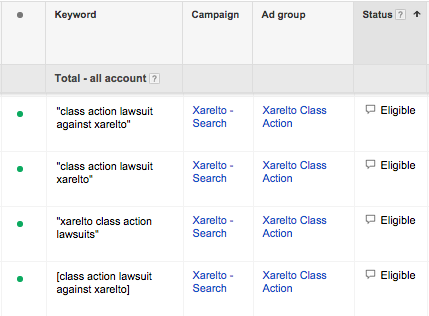 Just a few years ago, Google didn’t really offer any advertising customer service for PPC ads. Now, a real human customer service representative from Google will spend a few hours with you on the phone, if needed.